4 December 2018Bone Broth: health food or marketing hype? Soup isn't much of a hot weather food choice in my house, so I haven't looked at the soup aisle in the local grocery store for months. Last week I was looking, and found it had been transformed into the Broth Aisle. Well, I exaggerate, but it certainly seemed like there was as much shelf space for broth as for actual soup. When did that happen? Broth can be very handy. It's a nice comforting hot beverage. It's also useful in different kinds of recipes, from making your own soup to cooking grains like rice or making sauces or gravies. But unless there's been a spectacular renaissance of home cooking that's created all this demand for broth, I suspect another reason: the PR for bone broth. First, let's clear up what bone broth actually is. It's traditionally made by simmering bones that have been mostly stripped of the meat. Think of the turkey carcass after Thanksgiving. Or of the leftover bones from a roast chicken or a prime rib. These remains are primarily bones and cartilage, which are simmered for hours to extract protein and some minerals. The bones are strained out and discarded. The result was typically called stock, but now it's got the catchy name of Bone Broth. It contains protein, especially collagen, as well as significant potassium and a few minerals and vitamins in small amounts. Contrast this with classic broth, which is made by boiling meat scraps, not bones. Broth made this way has much less (if any) collagen. Vegetable broth, which takes up an impressive amount of space, is made by boiling various vegetables. Now for some confusion: many of the so-called "bone broth" products I saw on the Bone Broth Aisle listed "chicken broth" or "beef broth" as the first ingredients. NOT bone broth or stock. So what are you actually buying? Why do we even care about this stuff? 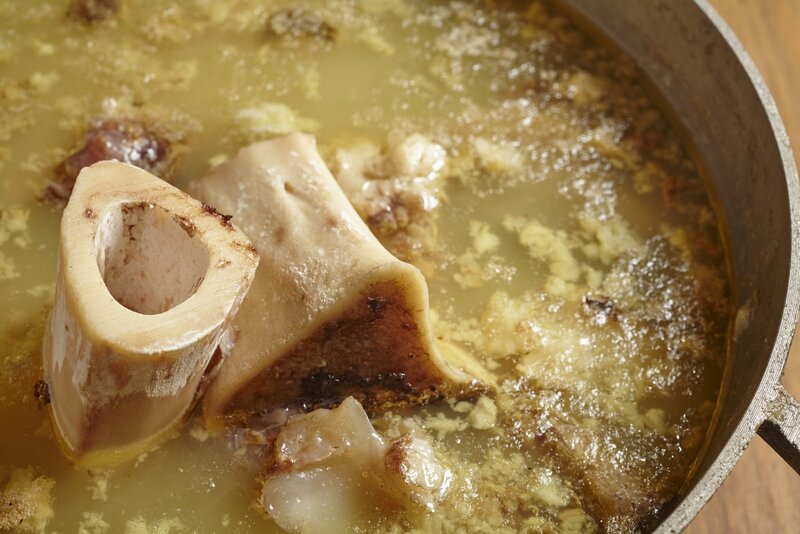 The idea of bone broth as a health food grew out of the Paleo Diet craze: it's made from bones. How very Paleolithic! Cavemen gnawed on bones; it must be healthy! It's being touted as a weight loss aid, and a detox agent that will remove pesticides and artificial ingredients from your body. It supposedly improves immune function, fights food allergies, prevents wrinkles, repairs achy joints and so-called leaky gut syndrome. In fact, many of the bone broths in the grocery store have references to the Paleo Diet right on the label. In fact, there is little evidence for any of these claims. The claims for joint health are based on the collagen content of bone broth. Collagen is a specialized protein that comes in different forms. The type found in bone broth is mostly the gelatin form (also used in gelatin desserts), which is plentiful in cartilage. It's called Type II. The collagen used in the studies of potential collagen benefits is typically what's called Type I, which comes from connective tissue, not bones. Does collagen have any benefits? Some studies using Type I collagen supplements showed minor improvements for some issues, like wrinkles around the eyes or joint stability, but only when people took significant doses of collagen supplements every single day for months. Many studies showed no benefit. Studies have not been done with actual bone broth, but that hasn't stopped marketers from making health claims. ConsumerLab (subscription required) recently analyzed popular bone broth products and found that protein/collagen content was all over the map. Some products had significant content of both; some had very little. Some products misstated the amount of collagen and protein in the product; products had less than was listed on the label. Few of them distinguished what type of collagen was present. Since few consumers understand the difference between Type I and Type II, why create confusion? Another important point: many contained significant added salt or other seasonings to create flavor. Plain bone broth is very bland. As noted above, chicken and beef broth are made by boiling meat scraps, and won't have any significant collagen content. That doesn't mean these aren't useful or comforting foods if you want a warm savory drink on a cold day. Simple broth will have fewer calories than a creamy soup, but is just as filling. And drinking broth before a meal might decrease your appetite for bigger portions or second helpings. So broth, whatever the source, can be a weight loss aid by cutting appetite, although it won't have any magical metabolism-boosting effects. The grocery store had so many "free range" chicken, beef and bone broths, I fully expected to see Free Range Vegetable Broth. What exactly is "free range" anyway? It's a feel-good marketing term. There is no standard definition. So called "free range" chickens are supposed to have access to an outdoor area, but it could just be a dirt yard or a gravel patch, not a charming farm yard. For cows or other animals, it's even murkier. You might think free range beef comes from cattle roaming around the picturesque Western prairies, eating grass. Not necessarily so. Some producers put "free range" on the front of the package, and then include their definition of what it means somewhere else on the label in tiny print. For some products, there was no difference in the ingredients' list of "free range" beef broth or regular beef broth made by the same manufacturer. I didn't actually see any "Free Range Vegetable Broth" but I wouldn't be surprised if some enterprising marketing whiz gave it a try as a way to make their vegetable broth look superior. No matter what they call it, vegetable broth will have no collagen, since it only comes from animals. If you buy bone broth for the alleged health benefits, that's your choice. Just be aware that there's little evidence of a health benefit other than as a warm and filling beverage. And any type of broth can provide that effect. As a person who makes my own stock (AKA bone broth), I can safely say that any commercial products I've ever bought have been watery and tasteless compared to homemade. Real bone broth should be so hearty that it gels up when you put the strained liquid in the refrigerator. Which of course means lots of the gelatin form of collagen has been extracted from the bones. If you're handy in the kitchen, you might try making your own after you're done with the Thanksgiving turkey.